With the summer sun receding, the memories of abundant light and (too much) heat are also fading. Sooner than we would like, we will be faced with winter’s gusts and fewer hours of daylight. But what if instead of seeing the sun’s energy as fleeting, there was a way to harness it? What if you could design your home in a way that would actively capture the benefits of winds and heat and light? You can – with passive solar design. – be landscaped for aesthetic purposes. – use larger trees and shrubs to shade the house in the summer, while allowing more heat and light to enter the home in the winter after leaves fall. But can’t a home use the sun’s energy without including passive solar techniques? Absolutely. Notice that all of the passive solar components above are void of electrical and mechanical assistance; this is what is meant by the term “passive.” A home can still include active solar techniques, such as solar panels, that use the sun’s natural energy to the home’s advantage with the assistance of mechanical devices. What’s best, however, is a home that employs both passive and active solar techniques to maximize the benefits to homeowners and occupants. Just like with active solar strategies, passive solar can lower electric bills. With the sun’s heat blocked by clever landscaping, orientation, and window design, a homeowner can save on summer air conditioning costs. In winter, if designed properly, the sun’s rays will enter the home and warm it, reducing heating costs. Homeowners are also generally more comfortable in a passive solar home, as natural light becomes the dominant lighting source over harsh, man-made bulbs. If siting is considered already for solar gains, a great designer will also take into consideration natural winds that can help keep a home cool and reduce the need for forced air system. Many passive solar strategies are simply thoughtful design. Here are some considerations to get you started. 1) Which side of the home will receive the most sun? This is a two-part consideration, as heat and light are both important factors when orienting the home. Typically, passive solar design won’t include a two-car garage on the sunniest part of the property. Instead, this space would be saved for living spaces that would benefit from natural light and the sun’s heat in the winter. 2) Go one step further and map out the plots of wind patterns. Does it make sense to rotate the home to capture some cooler summer breezes? 1) Window placement is key in passive solar homes. Think about “a day in the life” of the sun – where is natural light needed the most, and where will it create glare? Will excessive windows on the southern side (without additional protection) overload the home with heat and light in the summer? 2) Should shading devices on windows be installed to prevent the sun’s energy from entering the home? When angled in response to the sun’s path, shading devices will still allow ample light and heat into the home in colder months, and block out unwanted rays at the peak of summer. These shading devices can blend in with the home’s design while providing maximum benefit to homeowners. 1) How can landscaping be used strategically to help shade parts of the home in the summer and yet allow the most sun in the winter? For example, planting large trees to shade expansive living room windows will provide aesthetic benefits to the occupants in the summer, and leafless trees in the winter will allow the most sun to enter the home at the dead of winter. 2) Can landscaping help curb devastatingly cold winds? Trees and shrubs can serve as great buffers against the harsher features of Mother Nature. Once designed and built, passive solar strategies will continue to provide their benefits with no recurring costs to homeowners, save from the occasional landscaping bill. To get the maximum benefits from passive solar strategies, it is important to design with passive solar in mind from day one. Re-orienting a finished house or redesigning a facade is next to impossible for most, and good design from the beginning will keep long-term costs down and benefits up. Incorporate active solar strategies, like solar panels, as well – but remember, these will work best on a rooftop that is already designed in line with the sun. 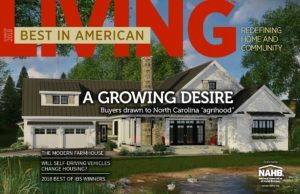 This article, written by Alexandra Isham, was originally published in the Fall 2016 Issue of Best in American Living.